It is about 1:40 EST as I sit in the St. Petersburg Media Center to start typing. It has already been an eventful day. First there was the first practice. Rookie Felix Rosenqvist led the initial practice of the season with a time of 1:01.8215, showing that his offseason reputation was not all hype. He apparently really is that good. Ryan Hunter-Reay was the second quick of the day with a time of 1:02.0636. The other Swedish rookie, Marcus Ericsson, was third quick with a time of 1:02.0811. Scott Dixon and Alexander Rossi rounded out the Top-Five. See a pattern? All five cars were Honda-powered. 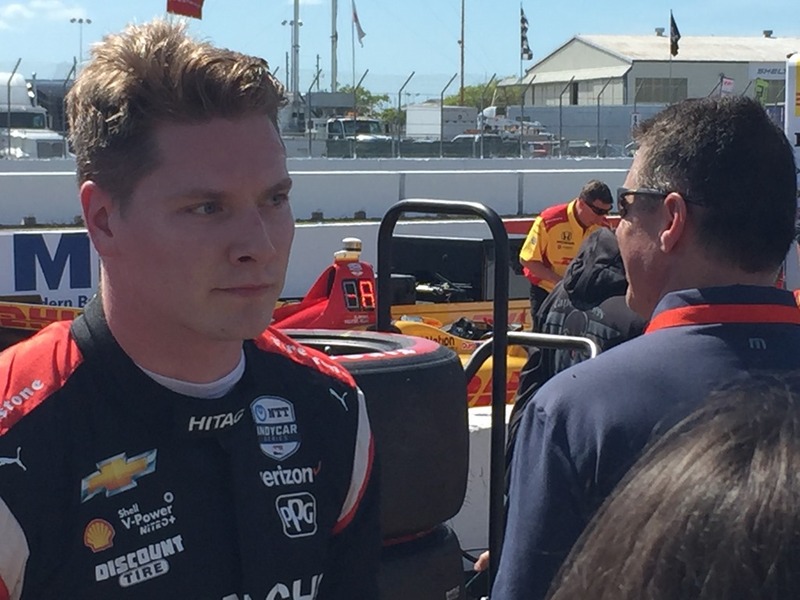 In fact, you have to go down to the seventh position to find the first Chevy,which was driven by Team Penske’s Josef Newgarden. His teammate, Will Power, was the only other Chevy in the Top-Ten. It will be interesting to see if this pattern continues in Practice Two, which is coming up at 2:20 EST. The bottom five were Matheus Leist, Santino Ferrucci, Ed Jones, Max Chilton and Ben Handley; all of which happen to be driving Chevys. Again, I’m not drawing any conclusions after one practice – but it’s something to keep an eye n throughout the weekend. I also took this video from just in front of the media center, overlooking the track as it heads down to Dan Wheldon Way. Not a bad site in early March. I posted this picture of the crowd on Twitter and Facebook. Keep in mind, this is to watch a Friday morning practice. 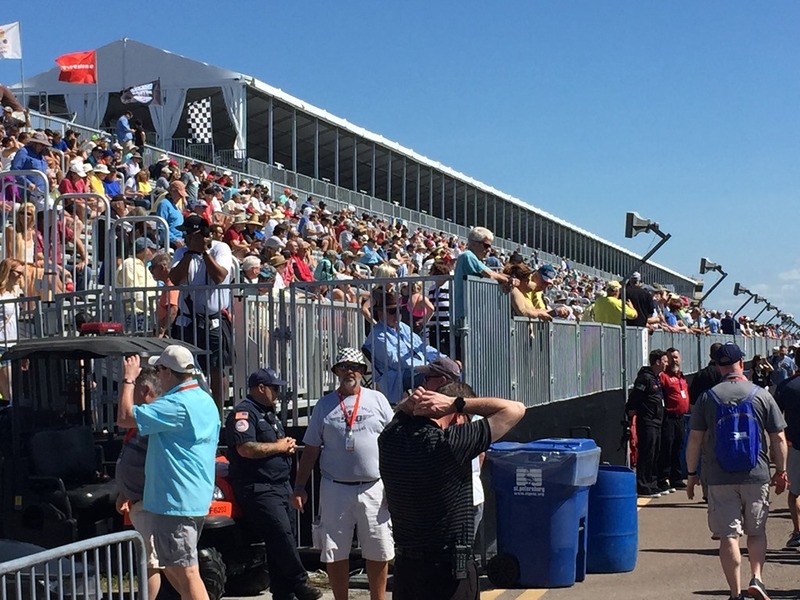 I’ve seen smaller crowds for Race Day at other tracks. Milling around during lunch time, I was still amazed at the size of the crowd and the buzz about this place. 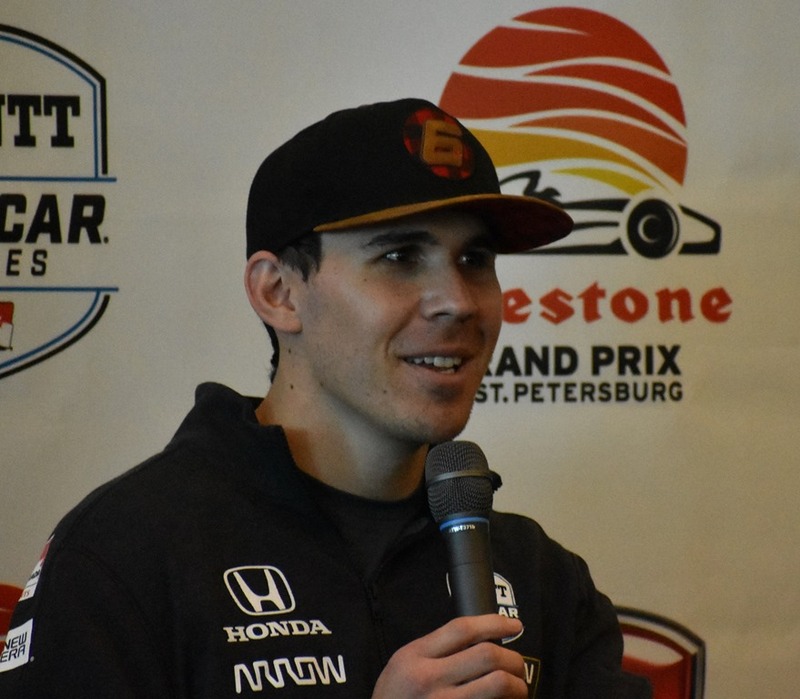 Just after practice, Robert Wickens had a press conference in the media center. He seemed happy to finally be in his natural surroundings – a race track. He spoke of the progress he has made since his injury, from the first “muscle spark” in October, to where he can now stand and partially move his legs. Whether or not he ever drives an Indy car remains to be seen, but it certainly looks like he is on the road to recovery for walking on his own again someday. When he finished, he received a round of applause from all of the assembled media, which is rare. OK, it’s almost tie for the next practice. We are heading back out. Pease check back later. In the meantime, please follow us on Twitter. Follow me at @Oilpressureblog and Susan at @MrsOilpressure. Back in a bit. This entry was posted on March 8, 2019 at 1:16 pm and is filed under IndyCar. You can follow any responses to this entry through the RSS 2.0 feed. You can leave a response, or trackback from your own site. I’m watching from the car in the middle of “Nowhere Mississippi” and it’s working great! Sorry you’re having trouble. I hope it works for you. Anyone else thinking the rookie battle might be as good as the overall championship battle this year? A Formula 1 driver, a Formula E/Sportscar ace, and two Indy Lights hotshoes? Unfortunate that Pato probably won’t be in contention due to limited races but I have a feeling he’s still going to make it interesting and be fun to watch. Should be good! I’m putting my money on Rosenqvist to come out on top at the end of the season, the dude has impressed me in everything he’s driven. Well I thought I was doing okay with Gold. Missed the first 7 minutes of Practice 1, but after it was over I went back and watched it. I missed Practice #2, but when I arrived home a few minutes ago I thought I would be able to watch it. Not! It is not even listed on my TV app neither is Practice #1. However, Practice 2 can be accessed on my phone and desk top. Very frustrating! What’s up with this?